These Creole Cream Cheese Crepes with Strawberry Compote are as delicious as they are beautiful. In a medium bowl, beat cream cheese with a mixer on medium-high speed until smooth, about 3 minutes. Add crème fraîche, and beat to combine. Add liqueur, sugar, vanilla, and zest. Beat until smooth and creamy. Cover, and refrigerate at least 2 hours. Preheat oven to 350°. Spray a 13x9-inch baking dish with nonstick cooking spray; set aside. Place about 2½ to 3 tablespoons cream cheese mixture onto edge of Vanilla crêpe, at least 2-inches from border. Roll crêpe burrito-style, and place seam side down into prepared baking dish. Repeat with remaining crêpes and filling. Bake until warmed through, 10 to 15 minutes. 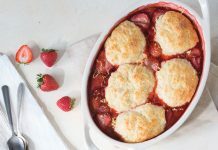 Remove from oven, and serve warm with Strawberry Compote. Garnish with confectioners’ sugar, fresh strawberries, pomegranate seeds, and mint, if desired. *If Creole cream cheese is not available, substitute 8 ounces cream cheese. In the container of a blender, combine flour, sugar, salt, half-and-half, eggs, and vanilla; pulse until combined. Strain mixture through a fine-mesh sieve into a large bowl. Cover, and refrigerate at least 30 minutes. Heat an 8-inch nonstick pan over medium heat. Pour about ¼ cup batter into pan and quickly swirl to coat the bottom of pan. Cook until top of crêpe begins to appear dry, about 1 to 11/2 minutes. Using an offset spatula, gently flip crêpe, and cook other side until done, 30 seconds to 1 minute. Transfer to a wire rack to cool. Repeat with remaining batter. Store crepes between layers of parchment paper to prevent sticking. In a medium saucepan, combine all but 11/2 cups strawberries, sugar, liqueur, and vanilla. Bring mixture to a simmer over medium-high heat. Cook, stirring often, until sugar is dissolved, about 3 minutes. In a small bowl, whisk together 2 tablespoons water and cornstarch, until smooth. Add cornstarch mixture to strawberries, and continue cooking, stirring constantly, until mixture thickens, 2 to 3 minutes. Remove from heat, and let cool slightly. Add remaining 1½ cups strawberries, and stir to combine. 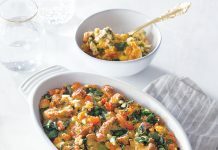 Cover, and refrigerate up to 3 days. 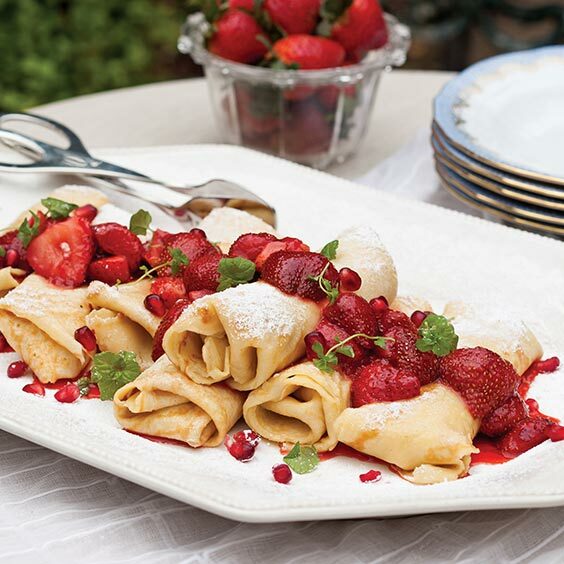 Cannot wait to try ths Creole Cream Cheese Crepes with Strawberry Compote. It may take me a while to find the Creole Cream Cheese. I found it once before but it took a trip to Lafayette, La. From Houston. It had to be here SOMEWHERE IN HOUSTON. I WILL LOOK NOW THAT I KNOW EXACTLY WHAT IT IS! If you can get your hands on some Creole cream cheese, it’s definitely worth it! If you can’t, regular cream cheese is a fine substitute. As it is, you may have difficulty getting Creole cream cheese many places outside New Orleans. Didn’t you have a recipe for creole cream cheese in one of your issues? My grandfather used to make it, but just called it cream cheese or cottage cheese, depending on how it was finished. We do have a recipe for Creole cream cheese right here at louisianacookin.com! 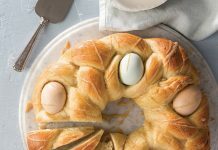 Here it is – https://www.louisianacookin.com/creole-cream-cheese-and-satsuma-king-cake/ – and in March, we’ll actually have a whole story about Creole cream cheese in the magazine. The season is certainly rite for the strawberries… I actually made crêpes this morning… it was some different from what is posted here but so de-lush!… made an orange sauce that is probably one of the tastiest … wish I had someway to post a pic!…. We wish you had a way to post a picture! If you have Facebook, you could post the photo and tag us @LouisianaCookin, or @louisianacookin on Instagram. If you’d like to share the orange sauce recipe, we’d love to see it! We print reader recipes all the time in the magazine. The recipe is missing rhe filling.